What Is Proofreading? A Definition In Seven Parts. What is Proofreading? Part One: a Very Basic Definition. Proofreading involves checking a document for errors. The proofreader highlights these errors using proofreaders’ marks (also known as proofreading symbols) then passes the document to its originator for corrections. The proofreader continues to check subsequent drafts of the document until it is error-free. And that, in a nutshell, answers the question what is proofreading? But of course, that doesn't really answer the questions of what proofreading is, at all. The reality is, unsurprisingly, a lot more complicated than that. Isn't it always? What is Proofreading? Part Two: Documents. What documents, exactly? Well, far from just proofreading manuscripts, proofreaders can proofread just about anything that contains text (generally referred to as ‘copy’ by industry insiders). Whilst I was working for one of the UK’s largest online and mail order retailers, I proofread literally thousands of catalogue pages. You could find yourself proofreading legal documents, promotional brochures, websites, text books, packaging, point-of-sale displays, press releases, magazine articles, advertisements, pharmaceutical labelling, in-house corporate communications (newsletters, for example, or training material), presentations, bids for construction contracts... In fact, you could find yourself proofreading just about anything. Anything in which the written word is printed and distributed is likely to require the beady eye and enquiring mind of a proofreader. So, when looking for proofreading opportunities, freelance or full time, don’t limit yourself to publishing houses. Cast your net as wide as you can. You’ll be surprised at how many organisations haven’t even considered hiring a proofreader until you draw their attention to the commercial benefits. What is Proofreading? Part Three: Errors. What kind of errors? Generally, you’ll be looking for spelling mistakes and grammatical slip-ups. However, your remit is likely to change from one employer to another. When some organisations hire a proofreader, they expect something more in the way of a copy editor. In other words, they want your input on the quality of the document not just the accuracy. You’ll be looking for inconsistencies, awkward phrasing, lack of clarity. You might also be expected to ‘do the math’. If your employer produces ecommerce website or a sales brochure, you’ll be expected to make sure everything adds up, particularly when it comes to those all-important prices. What is Proofreading? Part Four: Highlights. How exactly, does a proofreader highlight errors? Directly onto the document with your trusty red pen. You’ll want something fine that doesn’t ‘bleed’ on paper. Clarity is everything. You will circle or underscore the copy containing the error, then place a corresponding proofreaders’ mark in the margin. What is Proofreading? Part Five: Proofreaders' Marks. Proofreaders’ marks are the little symbols proofreaders use to indicate a particular kind of error. For example, when the symbol below is placed in a document’s margin, it tells someone to italicise any words or letters that are underlined in the copy adjacent to the proofreading symbol. It takes a while to become familiar with proofreaders’ marks but they really are essential, as they enable you to communicate a great deal very quickly and without using up too much space. If you were to attempt to write out everything in full, you’d soon find your document reduced to an illegible mess. What is Proofreading? Part Six: Originator. So, who will be producing the work I’ll be proofreading. By and large, it is likely to be a typesetter or graphic designer. Once you’ve marked-up your proof (and old-fashioned name for a pre-press document), you will either hand it back to its originator or pass it on to the next person in the production process. What is Proofreading? Part Seven: Subsequent Drafts. This is where the hard work begins. ‘First reads’ as they’re often called can be relatively painless, as you’re reading from a clean document. Once your corrections have been carried out, you’ll have to check a new proof to make sure they’ve been carried out correctly and in their entirety. This is the main point at which errors creep into a document. Often your corrections will have been overlooked or new mistakes may have been created whilst carrying out your instruction (for example, an ugly line break may occur or text may ‘drop off’ the bottom of a page). This is where you will have to have your wits about you, as you comb through your original marked-up proof, ticking off each correction only when you have confirmed that it has been carried out to your satisfaction. I hope that answers your question, what is proofreading? 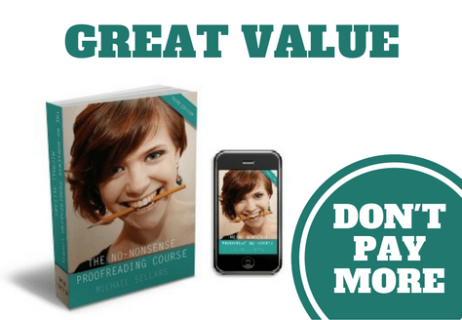 The No-Nonsense Proofreading Course is a downloadable eBook containing a wealth of information to help you learn to proofread and take the first steps to becoming a professional proofreader. It gives a full set of proofreading symbols, complete with instructions on how to use them; it offers a robust and thorough proofreading methodology; and it holds your hand as it walks you through the veritable minefield that is the ‘subsequent drafts’ stage of the proofreading process. Best of luck with all your proofreading endeavours.